To evaluate your home’s energy usage and performance, Hankins Homescapes offers a free insulation inspection of your home’s attic. According to Energy Star, a well-insulated attic can help you save up to 20% on your heating and cooling energy bills every year. Our visit includes checking your existing attic insulation levels and immediately letting you know if you are losing money through inefficient insulation. An under-insulated home loses up to 40% of its conditioned air through the attic, costing you money. With energy costs rising, insulation becomes more important to home and business owners with each passing season. Whether to keep out the cold, or keep the cool in, maximizing your R-values can pay for itself many times over the lifetime of a building. Hankins Homescapes estimators know of and offer a dizzying array of products to button up your building in every location, bringing you the greatest value and efficiency We have partnered with Owens Corning, the energy efficiency experts, to provide a unique new product called Atticat. We want to make sure our customers are maximizing their opportunities to save on the escalating cost of energy. All it takes is a quick peek to find out. If your attic floor is insulated but the wood beams (joists) are still visible, you probably don’t have enough. But even if you can’t see your beams, that’s still no guarantee that you have enough insulation. The best thing to do is measure. Ask us to have one of our Roofing Professionals from Hankins Homescapes do a free attic insulation analysis. For maximum energy efficiency, we recommend an insulation value of R-60 for attic floors – about 18 inches of insulation. Do you have enough? 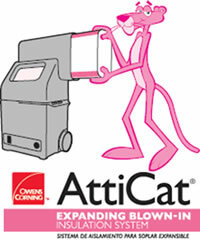 Adding insulation to your attic is a blast with the Hankins Homescapes AttiCat® Insulation Blowing Machine! 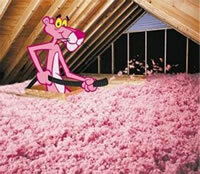 It conditions the AttiCat® Expanding Blown-In PINK Fiberglas™ Insulation by breaking it up and fluffing it, adding millions of the tiny air pockets that give the material its insulating power. The insulation is conditioned further throughout the length of the hose, and as it bounces its way up to your attic, more and more air pockets are added, increasing its insulating power even more. 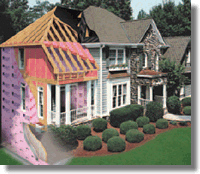 And since Fiberglas™ insulation will not settle, it will keep its energy-saving R-value over time. An attic analysis is free from a Hankins Homescapes Professional. Give us a call to arrange your inspection today!